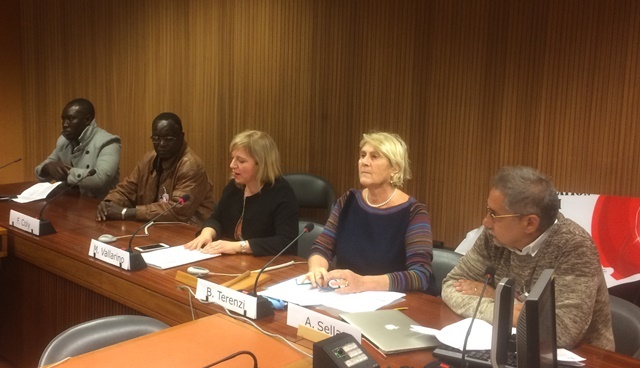 On the 14th March 2018, the International Movement Against All Forms of Discrimination and Racism (IMADR) and VIS – Volontariato Internazionale per lo Sviluppo co-organized the side event on “Circular Migration and Youth” at the 37th session of the UN Human Rights Council. Ms. Barbara Terenzi (Coordinator, VIS Human Rights & Advocacy Office) moderated the event and Ms. Michela Vallarino (Vice-President, VIS) delivered the opening remarks. Speakers included Mr. Agostino Sella (President, Don Bosco 2000), Mr. Fousseynou Diallo (Coordinator, Don Bosco 2000 Center), and Mr. Francois Coly (Director, Salesian House). The event was also joined by representatives from various Salesian programs: Leslie Tavares, from the Dominican Republic, Meaza Tesfagiorgis, from Ethiopia, Walter Thyrniang, from Zambia, and Gianpaolo Gullotta from VIS in Ghana. Ms. Michela Vallarino delivered the opening remarks. She appreciated this opportunity of sharing some experience working in the field of human rights promotion and protection along the Human Rights Council. She introduced VIS, which has been on the frontline of human rights work both within the United Nations human rights mechanism and on the national and regional level. She then pointed to the Senegal Project and hoped that through sharing practices of this case regarding migration with a particular attention to the rights of youth would provide some insights into how to form concrete positive actions in the delicate context of migration and fight against discrimination. Ms. Barbara Terenzi said that VIS is presently strongly committed in the area of migration with special attention to children and youth at risk and in marginalization. VIS and Don Bosco 2000 are NGOs within the Salesian Family of Don Bosco, which has establishments in more than 130 countries and is structured through PDOs (project and development offices). The circular migration pilot project of Don Bosco 2000 in Senegal is an example of the project funded by the EU and participated by 36 PDOs, focusing on strengthening the capabilities of CSOs through multi-actor cooperation. She highlighted some main concepts to take away from this experience: migrants can be transformed into cooperation actors and they are a great resource for both the country of origin and destination; combining sustainable development interventions with start-ups and micro-enterprises in the origin country can be an alternative of emigration and a solution to combat human trafficking. Mr. Agostino Sella started by introducing the Senegal project. Through this project, migrants arriving in Italy acquire necessary skills during their shelter within the Don Bosco 2000 community. They then return to their countries of origin to transfer the knowledge and skills they developed in Italy, benefiting their local communities of through implementations of local development projects in the field of tourism, handicraft and agriculture. With the help of VIS and the local Salesian center, 33 young Senegalese with experience in tourism, handicraft and agriculture were selected. 22 out of the 33, expressed strong interest in working in agriculture to create a vegetable garden in their village where the land is only cultivable for 4 months per year, during the rainy season. The land is uncultivable for the remaining 8 months due to excessive heat and lack of agricultural technologies. Thus, the first aim of the project is to realize a one-hectare sustainable vegetable garden in Wassadou village with self-sustainable technological irrigation methods, with the hope of creating a multiplying effect among all villages in the area. Last month some Italian experts in agriculture from Don Bosco 2000 went to Tambacounda to train the young Senegalese to help them realize the vegetable garden design with drip irrigation powered by solar pumps. The one-hectare vegetable garden of Wassadou will allow vegetable cultivation for 12 months a year without being affected by the dry season. Four Senegalese boys, who wanted to leave for Europe, Adama, Doudou, Maxime and Genorim, have learned how to set up the device and they would independently apply the same technology to other villages of Tambacounda in the following months. The target of the project is to create 6 one-hectare vegetable gardens in 2018 and to multiply them by 2019 to realize 12 hectares of garden which grow horticultural products with biological methods that would be placed on local market. Mr. Sella concluded by pointing out that the final objective of this intervention of VIS and Don Bosco 2000 is to help young Senegalese start self-entrepreneurship. To this end, an office has been established in Tambacounda as a business incubator for all the young people who want to start an enterprise. Mr. Fousseynou Diallo started his testimony by introducing himself. He goes by Seny and comes from Tambacounda, Senegal, one of the poorest regions of the world. He left his country in 2013 in hope of pursuing a better future. After a long voyage through the desert and Libya, he boarded a boat and reached Lampedusa, Italy, on 25 October 2013. After a month of shelter, he started to collaborate with the association (Don Bosco 2000) as a linguistic mediator, where he then became a cultural mediator after attending the training courses. In the Don Bosco 2000 center in Sicily, he worked on the vegetable garden with the drop irrigation technique. The idea of bringing this technology back to his country, where the land is uncultivable for eight months a year due to lack of water, came to him. Hoping to return to homeland to help people and contribute to the community there, he started the project with the association Don Bosco 2000 in collaboration with the Salesian Center of Tambacounda and VIS. In Tambacounda, Mr. Diallo became the reference point of many of his friends from childhood who seek help in realizing concrete enterprise and development plans. He saved them the trouble of traveling through the desert and the sea. The business incubator established in Tambacounda is now attended daily by many young people who arrive from villages around Tambacounda and rural areas where poverty is extreme and want to start their own enterprise in the field of tourism, craftsmanship and mainly agriculture, which best suits the developmental needs of the area. A one-hectare vegetable garden has been built up, with the help of some Italian experts who have taught four of the young people on the program how to make a drop irrigation vegetable garden. He currently works as the coordinator of activities at the center in Senegal and goes to Italy to stay for one month every three months to meet and train young Senegalese arriving in shelter centers. He said that the goal through the project is to try to provide those who wish to return in Senegal with the same opportunity as he had, to realize what he has been able to achieve with Don Bosco 2000.